Happy Friday…I mean Saturday x_x I’m so glad to share the awesome news I received this week…I have 50 followers! Now I know that maybe this isn’t a lot of followers for more “seasoned” bloggers, and that maybe I have accumulated you all quite slowly, but nevertheless I am still so excited and happy! In honor of such an occasion I have decided to give something to you (sorry, but it’s not an actual gift). I have a recipe to share with you! It really is just a simple twist on your regular pineapple upside down cake, but hey, it’s a summertime favorite and recipe twists are fun! It’s very easy to make, and will be a favorite at any event you go to this summer. 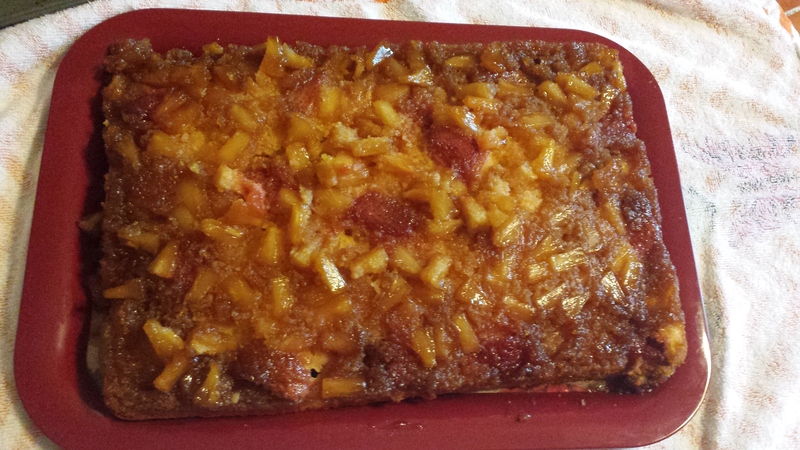 Basically, I wanted to make pineapple upside down cake but didn’t have any pineapple rings or cherries. So what did I do? I Improvised with diced pineapple and strawberries! I really like the way the strawberries made it taste. It added a fresh sort of sweetness. I call it…Pineapple Crush Cake! 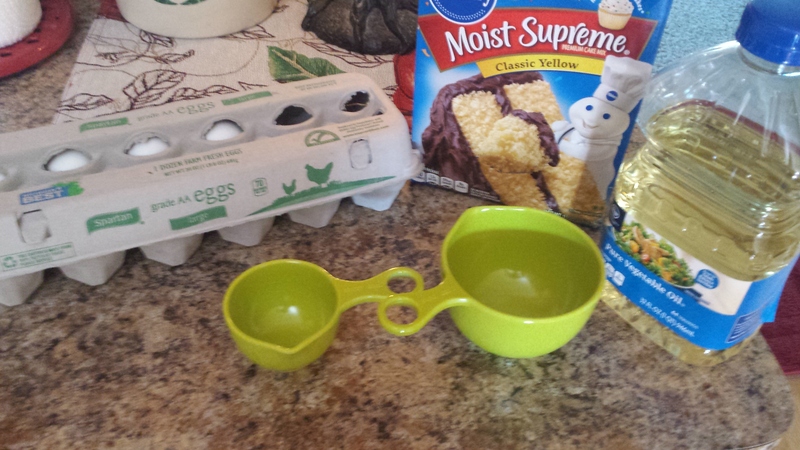 You will need a boxed cake mix–either yellow or white, but I prefer yellow (Pillsbury for life!). And eggs, water, and oil as the recipe on the box calls for. Mix it all up like the directions say. Meanwhile: Get out your cake pan and line the bottom with about an inch of brown sugar (no one said this was healthy). There’s no need for cooking spray as the sugar will caramelize. Then take your pineapple and DRAIN THE JUICE in the sink. Spread the pineapple slices evenly on the brown sugar. Next lay your strawberry slices on top and set aside. 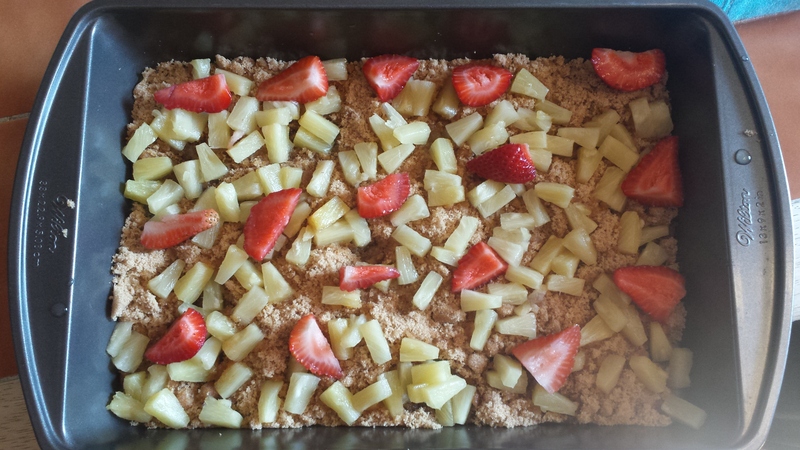 Once your cake mix is all made up, pour evenly over the pineapple/strawberry layer. Then bake in the oven for however long the box directions say. A good tip is that the cake should spring back up in the center when touched. If it does that, then you know it’s done. If it sinks, then it needs more time. Once the cake has cooled down, you will be ready to do the fun (and sort of tricky) part: flipping it! 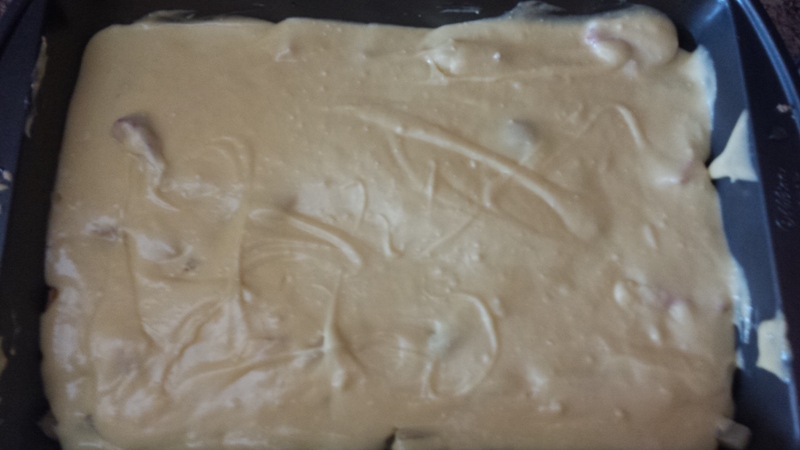 To do this you simply set another pan or same sized tray over the cake and hold tightly. Flip it really fast and set it on the table or counter. Make sure you pound the bottom of the first cake pan in order to get all of the cake out (sorry I don’t have a pic for this). Now you have a delicious, gooey, super sweet summertime dessert. Hungry yet? Lol, this is my first time posting a recipe, so I apologize if anything is unclear. If you have any questions don’t be afraid to ask me in the comments section. I hope u get to 100 soon.